This article isn’t so much about taking traffic school. That’s easy. This is about what comes after. After you’ve finished traffic school, and after you’ve received your certificate of completion. 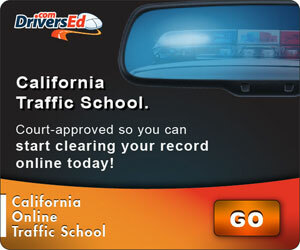 Today, I’m going to look at the traffic school reporting process in California. It’s important because most people don’t understand it. And understanding traffic school reporting is the pathway to a clean driving record. I can’t stress enough how important it is to get the above information right. No typos! Typically if CA DMV rejects the completion your traffic school will notify you but let’s try to get it right the first time! I also want to point out something important about Los Angeles. In L.A., the DMV sends all its completions down through the Los Angeles Central District Metropolitan Courthouse and they filter it down to all the other courts in the county. So if when you’re filling out your registration for traffic school and when it comes time to pick the court for your ticket at the Santa Monica or Malibu courthouse and all you can find is Los Angeles Central District, just know they handle everything for dozens of other L.A courts and it’s the right choice to pick. Now you completed traffic school, and maybe you’ve already shown off a certificate of completion to a judge, just know, this still isn’t over. Your traffic school will likely report your completion to DMV right away but your DMV record will probably not reflect traffic school right away. This is where you being the responsible adult that you are is pretty important. You need to stay on top of this. Even if you did everything right, it could be 3-4 weeks before DMV updates your record to keep those violation points from showing up. About a month after you complete traffic school, call the DMV and check the status of your traffic school completion to make sure DMV has it. The DMV hotline is 1-800-777-0133 and is available Monday-Friday 8-5PM. You can also pull your driving record online from CA DMV here to check. If your record still doesn’t reflect traffic school at about the 1 month mark, I advise you contact your traffic school and ask them to re-report you. Then give it a couple more weeks and follow up with the DMV again to make sure your record now reflects traffic school. Keep in mind, a bad traffic violation can spike your insurance premiums 22% higher for 3 years and even affect prospective employment. I can’t tell you the massive amount of people, six months down the line I’ve seen with bad driving records, and higher insurance because after they got their certificate of completion they figured they’d taken care of everything. It’s worth making sure you do things the right way! Check your records!